Watch the live stream, without sharing your own video (like watching TV) : Just turn up at the event page at 9pm Eastern (or whenever that is in your timezone), and Josh will share the link. Alternately, head over to Josh's Youtube Channel ( youtube.com/user/RealJoshHewett ) - it'll also be streaming there. To share your own video, and ask questions of the interviewee : Answer 'Yes' to the 'Are You Going?' question on the event page. 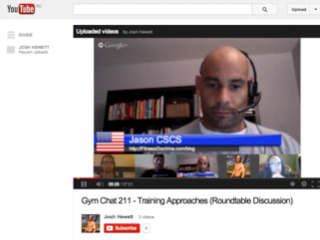 And once again, Kirk will share the relevant URL just prior to the Gymchat. 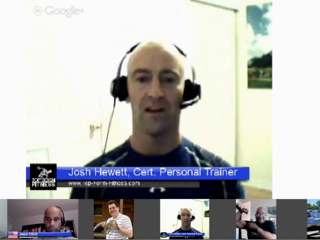 If you can't make it, or would like to watch it again : The entire video will be available on Josh's Youtube Channel ( youtube.com/user/RealJoshHewett ), shortly after the Gymchat each week. You can also subscribe to future episodes on that page. 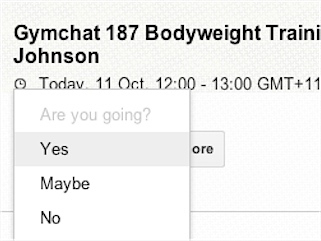 And if you'd like to be interviewed in a future Gymchat, just send Josh a message. Cheers for that.